The audio, a series of interviews with supporters at Place du Peuple on October 15th, was originally aired on CKUT's Off the Hour on Tuesday, October 16th, 17h-18h. At 11 AM on Monday, October 15th, Square Victoria was silent. The small park in the center of the financial district showed no signs of the revolutionary social movement that claimed possession of it exactly one year before. Occupy Montreal had planned its anniversary celebration of its occupation of the park for noon on Monday. By one o’clock, about one hundred people filled the square. “People are on anarchist time,” joked Paul Bode, an Occupy Montreal organizer. Someone wrote Place du Peuple on the statue of Queen Victoria, the name that the occupiers chose when they renamed the square last October during the occupation. As people milled about with cardboard signs and red squares, and two students played hackey sack, it began to take on some of its revolutionary shimmer of last fall and become, once again, the Place du Peuple. Koby Rogers Hall and Frédéric Biron Carmel were responsible for the installation of photographs of last October’s occupation that were mounted on red poster board throughout the park. The photos were placed according to their respective vantage points in the square. The installation was part of their collaboration on [P(re)]occupations: The Living Archives of Occupy Montreal, which is opening at the Skol Center of modern art on Friday. 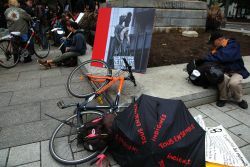 “Occupy’s one-year anniversary is just another opportunity to highlight what is an ongoing global mobilization, bringing attention to these longstanding struggles and overall injustice,” added Koby Rogers Hall. Simon Lussier is a journalist for OM99% Media, which he described as one of a few “spin-offs” from the Occupy movement, including La Chorale du Peuple, a group of activists who perform anti-oppression songs and the Assemblées populaires autonomes des quartiers (APAQs). He thinks Occupy Montréal’s greatest accomplishment is the mobilization that it subsequently inspired. Perhaps the Occupy movement has moved past the tent cities of its origin to more direct action, allowing activists more time to focus on real issues, rather than how to construct a winterized camp that abides by the city's guidelines for temporary structures. But after the boundless hope that overwhelmed the Place du Peuple last October 15th, the park felt a bit empty this year. Alejandro is a Mexican activist and artist who is part of a theater collective called Poécirque and was one of the hundreds of people who occupied Square Victoria last fall. 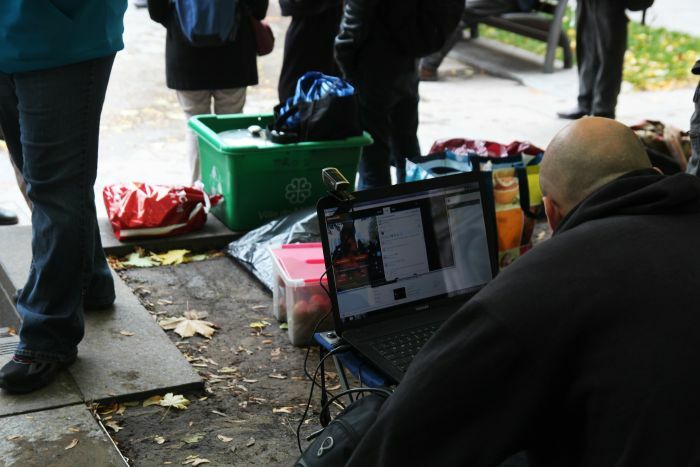 He acknowledged the significance of maintaining a presence in the public consciousness, despite Occupy Montréal having vacated its very public occupation of the park. Of course, Occupy Montréal does still exist: activists still gathered, and they're still organizing with just as much energy as they were a year ago. But there was less of the sense that mobilization was spreading beyond hard-bitten activists to normal people, or that those people would rise up together and demand social reform. It was harder to be as wildly optimistic.